Sound morbid or spooky? 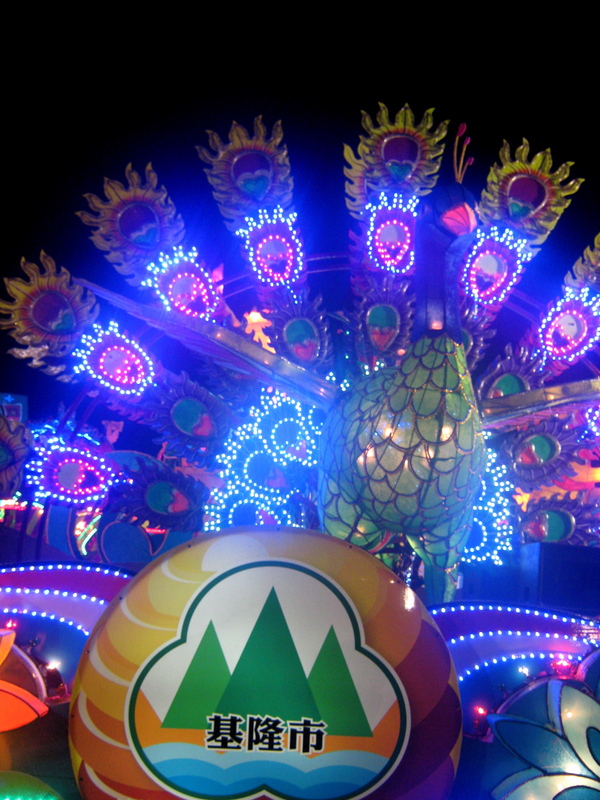 Luckily in Taiwan, Ghost Month is quite raucous, loud, full of bonfires, parties in front of temples, festivals, and sacrificial offerings of food, paper money, and treats for one’s ancestors– who are just on an extended visit. Like a summer holiday with the in-laws, if you will. The list of “Don’t”s for Ghost Month, though, is quite superstitious, and a little creepy–or funny– depending on your tastes. To avoid getting snatched up by one of the ghosts, or casting bad luck on your family to come, you better NOT…. … go out alone at night, or camping, or to the tops of mountains alone. You might get snatched! … move into a new house, buy a new car, or go on vacation. Bad luck! … swim in the ocean, lakes, or rivers– ghosts can catch you and sweep you away! I’ve heard pools too, but that seems like a bit of a stretch. … buy sculptures, dolls, or puppets. … do anything too risky, alone, at night!!! 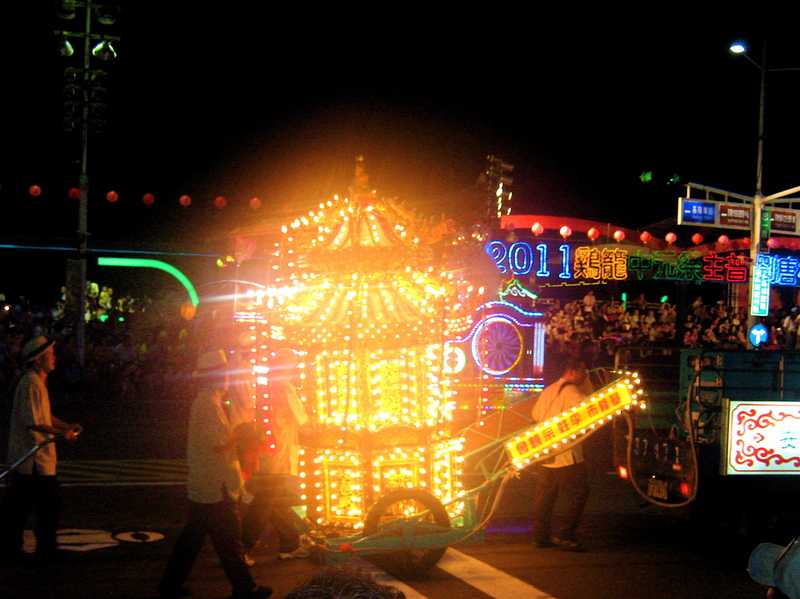 Smack in the middle of the 7th lunar month is the 中元節 (zhong yuan jie), or Hungry Ghost Festival (or just Ghost Festival, but I prefer to add the ‘hungry,’ since it adds a visceral sense to the term!). 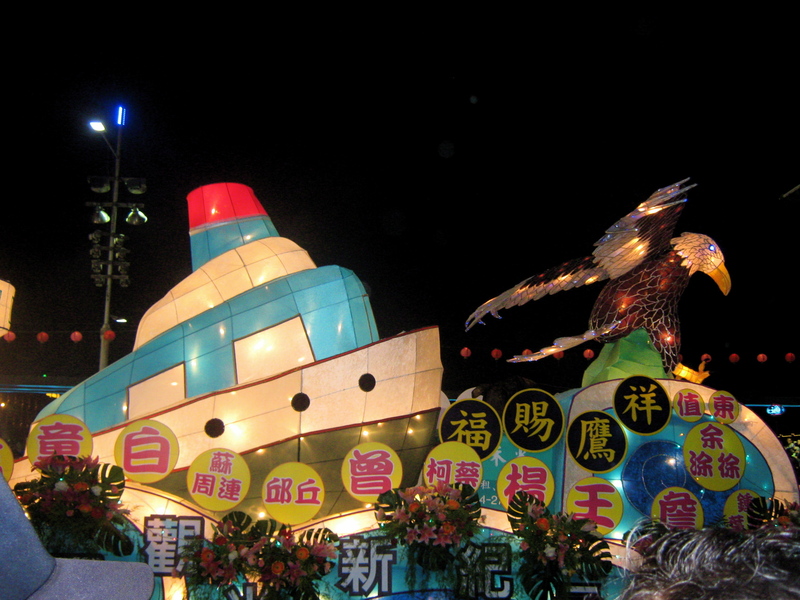 It fell on this past weekend, so with some friends, I ventured out to Keelung, the northern Taiwanese harbor city for the most famous Hungry Ghost Festival on the island. Below are some photos from the festivities. 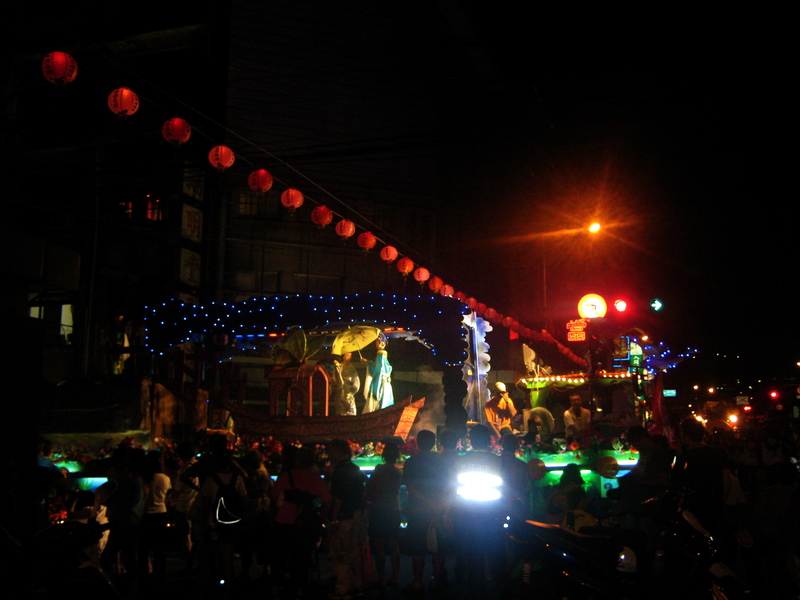 We stepped out of the train station and practically into the parade, a several-hours long procession of intricate floats, high school and college marching bands, music, firecrackers and fireworks, and streetside stands selling food and giving out cups of juice. Everyone was in great spirits– and after the parade ended, the entire city trooped down to a “nearby” beach (actually not so near, a fairly far shuttle bus ride away, but it was free! 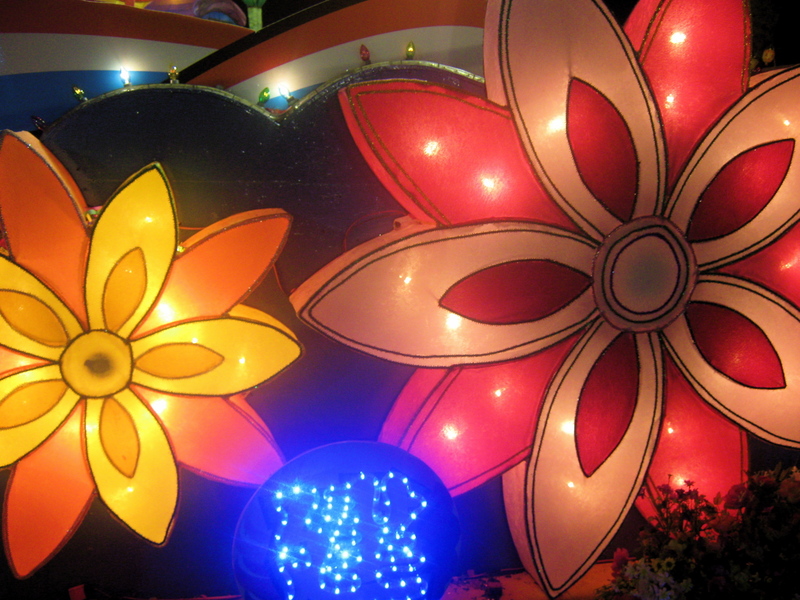 ), where paper lanterns from all the floats are removed. 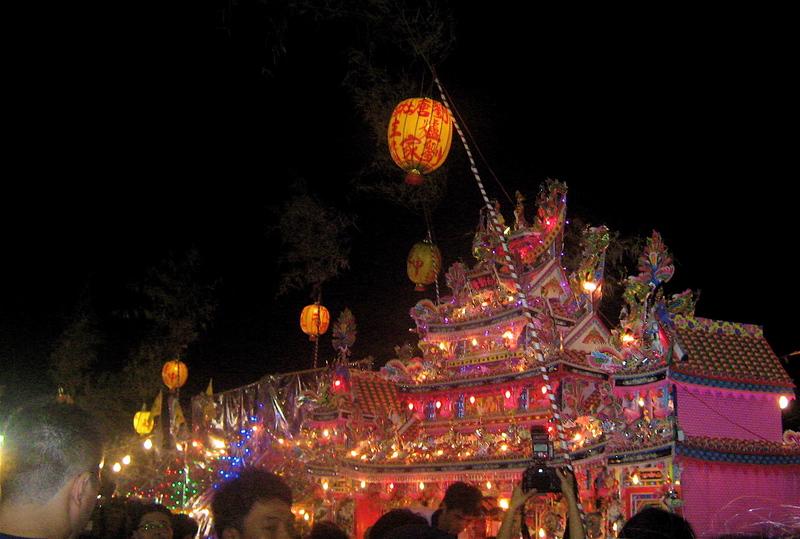 The paper lanterns have already been filled with paper money, ornately folded paper flowers, and other offerings to the ancestors, with fortuitous messages written on the sides. Then they are taken down the ocean’s edge and set on fire. And floated out to sea. These water lanterns, or 水燈 (shui deng), were quite spectacular to behold, and followed a great fireworks display– which we decided diverted the crowd’s attention so the lanterns could be arranged and prepared at the water’s edge. 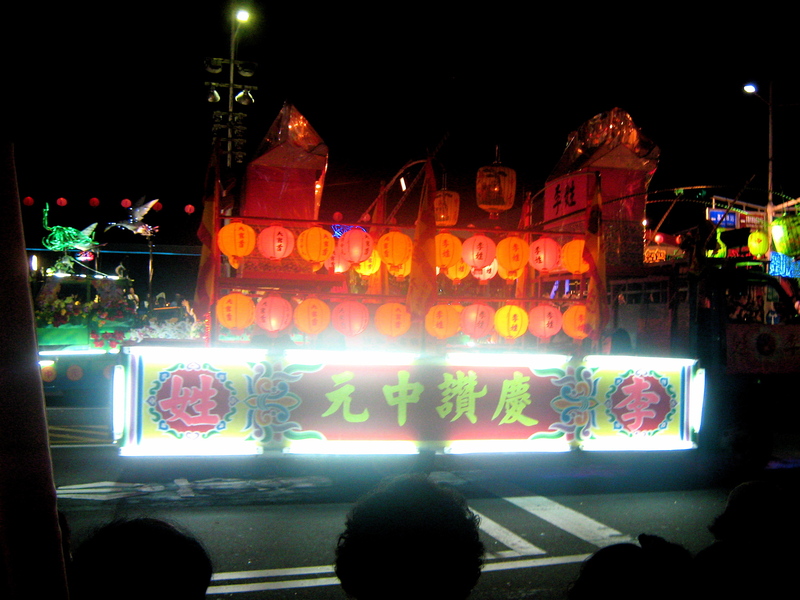 Supposedly, the superstition is that the further your family’s flaming water lantern goes in the ocean before it succumbs in a burning mass into the water, the better your luck for the coming year. (Actually, the lanterns floated out to a team of boats waiting to guide and clean up the lantern wreckage– it was a carefully supervised event.) 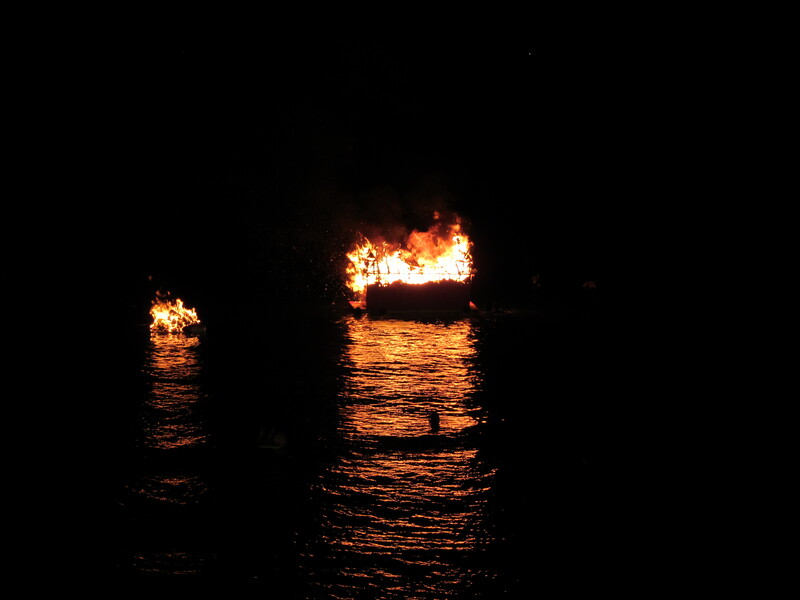 In its metaphorical burning and release of ancestor sacrifices into the ocean, I find the water lanterns quite a beautiful ritual, actually. A full moon shone overhead, as my adventurous friends and I stood elbow-to-elbow with Taiwanese residents, observers, and tourists from all over the island. In a collective gasp at the first lantern’s commencement out to sea, and a collective sigh at the last one’s departure– there was a real feeling of shared community. I remember thinking of how comforting it must be to pay homage to your whole society’s ancestors, the collective ghosts, as a community. 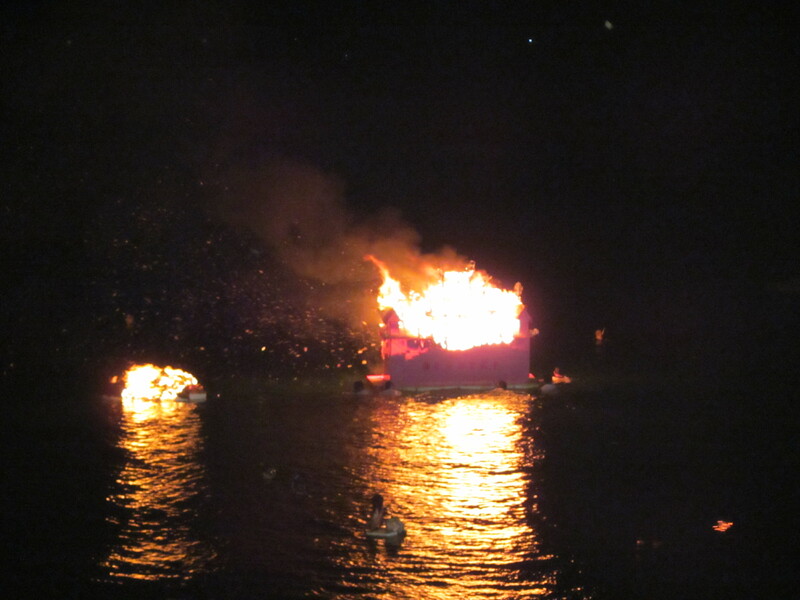 And personally, as someone who has felt haunted by many family and history ghosts ever since arriving in Taiwan and beginning to uncover the stories of the White Terror period, I felt some catharsis in watching these flaming beacons float out to sea. 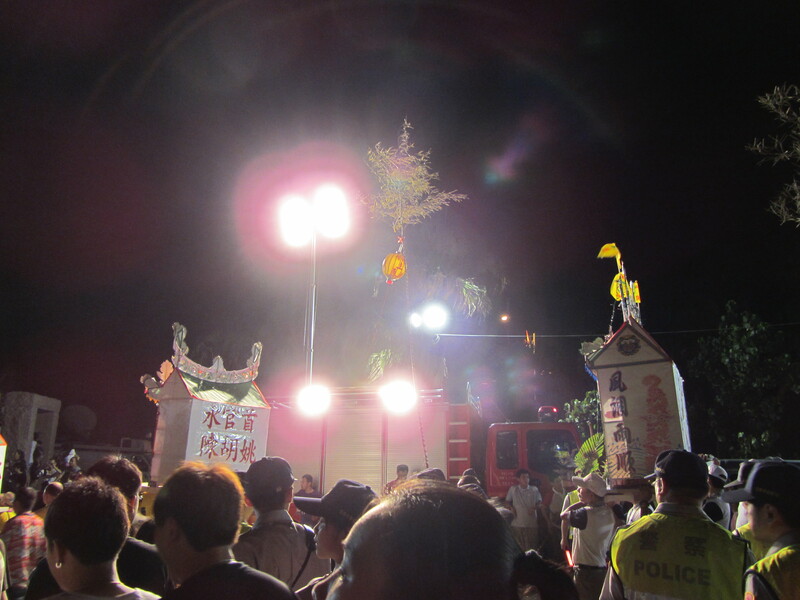 I am not really a religious or spiritual person, but the holiday rituals such as this one in Taiwan– although many are Buddhist or Taoist in origin– often feel less dogmatic than simply traditional. A cultural tradition, after all, is one that brings comfort, and security, and renews your sense of belonging, and of wonder. So the ghosts are fed for the year! 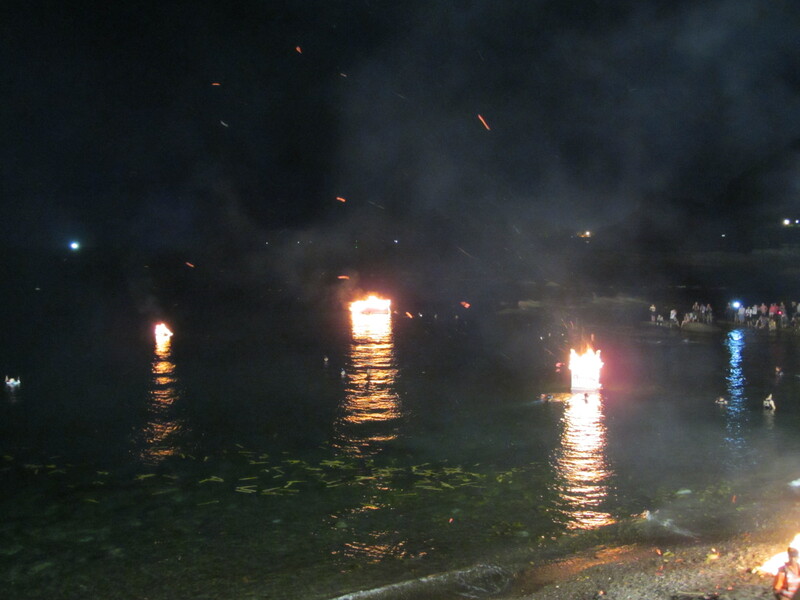 When I returned home much later that night, there was a roaring bonfire outside the small temple by our apartment. I felt peaceful and empty, and went upstairs and right to sleep.